Five-year relative survival rates describe the percentage of patients with cancer that are alive five years after their disease is diagnosed. Use of 5-year survival statistics is more useful in aggressive cancers that have a shorter life expectancy following diagnosis (such as lung or pancreatic cancer) and less useful in cases with a long life expectancy such as prostate cancer. When a patient achieves that magical 5 year survival mark, everyone celebrates the milestone and they are considered by most people to be “cured.” That is not necessarily accurate. What it means is exactly what it implies: They have survived five years since being diagnosed, nothing more. 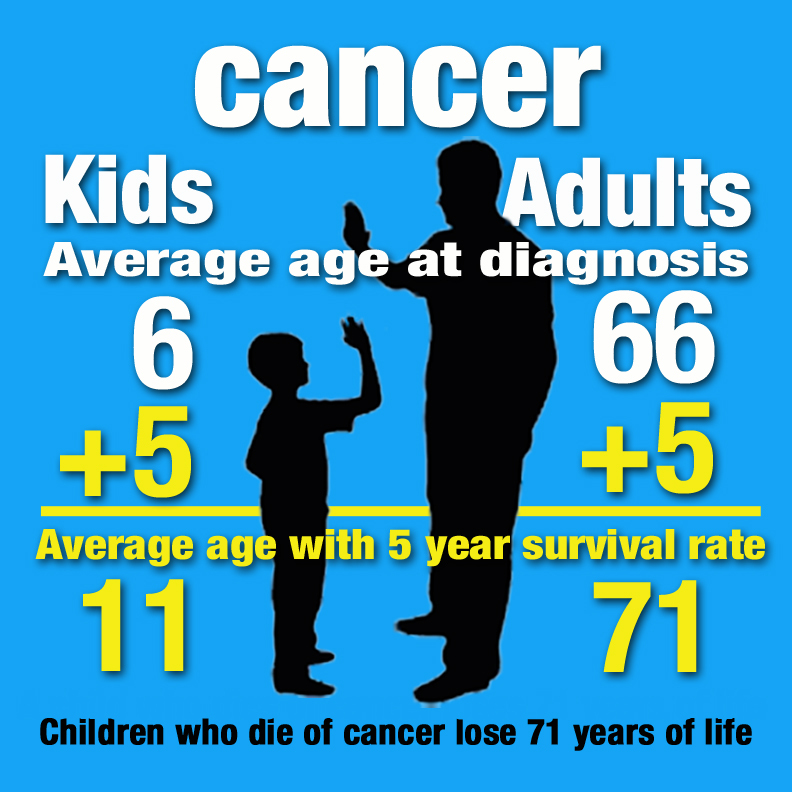 The average age at diagnosis of cancer is 6 for children and 66 for adults. While the chart at the right shows great progress in five year survival rates in childhood cancer from one period to another, it is only comparing five year survival rates, nothing more. While it gives some comfort that we appear to be making good progress, it does not really measure survival beyond a five year period. Using a standard five year survival rate for cancer will take an adult diagnosed with cancer up to age 71, but it only takes a child up to age 11. Has the child really “survived” and beaten cancer? Sadly, the answer for a large number of children is, “No.” We need a more accurate “survival” measurement for children. 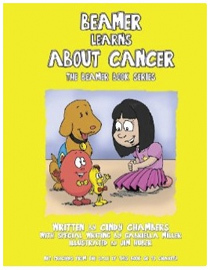 Kids cancer is not the same as adult cancer and survival for children must last much, much longer than just five years. As we do today, using a five year survival rate for childhood cancer grossly discounts the pitfalls that lay ahead for up to 95% of the survivors. When it is communicated in such a way that others outside of the childhood cancer community can fully understand the long term impact cancer has on children, only then will we finally make childhood cancer a real priority. 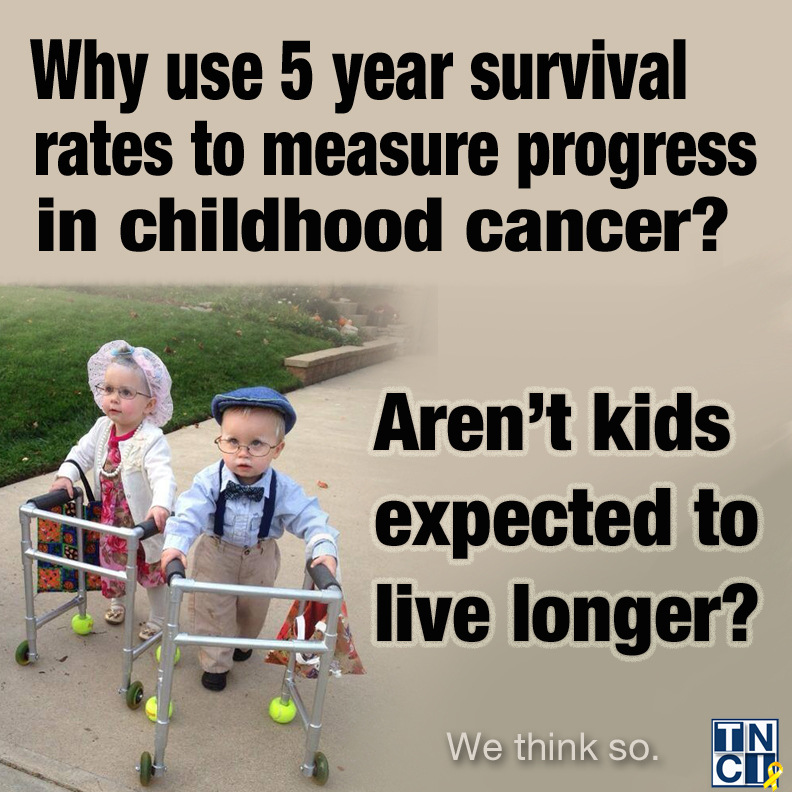 Let’s stop hiding from the reality of childhood cancer by using unrealistic five year “survival” rates. True progress in surviving childhood cancer can not be measured by only looking at the five year period from diagnoses. Today, advocates and medical professionals frequently cite 83% as being the average survival rate for children. In reality, the 30 year survival rate is only 65% overall. A long term survival rate such as this gives a much different and more realistic perspective to the general public who we rely on to help fund research. We’d love to see the American Cancer Society or even the National Cancer Institute to step up and address the need for looking at a more realistic method of measuring survival for children. There are several pieces of good legislation in play now that would benefit childhood cancers by improving research opportunities and increasing drug development. This article is about how children with cancer are surviving longer. However it also points out the lack of research and funding for pediatric cancer. What the article does not say is that a major number of the children do not live to be adults. I am not angry and I am not bitter. I refuse to become that way. Through our Faith we stay strong. However, our children are dying. How can you tell a parent of a 1 year old your child may live for another 5 years and that is considered good, or a mother of a 6 year old your child has 5 years. Both these children would die at a young age. These children would also go through horrible medical treatment to keep them alive. Five years is NOT ENOUGH for our children! I know this because my son, Tony, was diagnosed with Clear Cell Sarcoma of the kidney at age 11 in July 2011. He finished treatment in February 2012. He lost his hair, had multiple surgeries, had a kidney removed, and was given medication that caused him to be so sick he lost 25 pounds. He was given radiation treatments, he hurt all the time. It hurt to walk or play and he never felt like eating because he was nauseous all the time. He was so sick. He smiled though most days. Most of the children do smile most of the time. For one year after treatment he still had to go to the clinic numerous times and have radio- active or nuclear meds put in his body along with numerous scans, MRIs, and CTs. He made it one year with no sign of cancer. On February 8th 2013 we were told that Tony had a mass where his kidney use to be. On February 12 he had a biopsy of the mass. His liver bled during this biopsy and he was put in the hospital. On February 13 we were told Tony’s cancer had returned. We were referred to the National Institute of Health for a Phase 1 treatment called Ipilimumab. This treatment will make his T-cells over work to try and attack cancer cells. The effects of this medication are bad autoimmune side effects. This, we hope is his cure. This medication has been used on adults, but not many children. He will be the 8th child to receive this medication at NIH and the first child with Clear Cell Sarcoma to receive it. He may have to have a chemo that is called ICE next. He will have treatment every 21 days at NIH which means we have to fly to Bethesda, Maryland for treatment. In between treatment he goes to All Children’s hospital in St Petersburg, FL several times during the week. His only complaint since re-diagnosed is he wants to have his port back. You see he has had over 20 blood draws and/or IV’s since February 8th. Last Friday, March 8th 2013, while we were at clinic for a blood draw and a physical check to see about side effects I listened to what was going on there. I have listened in the past, but this day I realized something, it sounded like we were hearing a torture chamber of children and babies. I heard babies screaming, I heard toddlers yelling and saying “help me”, I heard school age children screaming and yelling “please don’t hurt me.” I heard a child yell “Mommy let me go, help!” I saw children trying to run away and I saw children sobbing. These children were getting port accessed, blood draws, large needles stuck in both their legs at the same time for chemo, and finger pricks to check counts. These are just a few of things these children and babies go through that have cancer. These brave and strong children have to go through this over and over and they just might survive past 5 years, or they might not. If they do survive they will have long term side effects from this treatment. I will say again I am not angry or bitter. I hurt though, a hurt I could never imagine feeling to my soul. This hurt is out of fear for the life of my son, but also for many other children we have met going through treatment. The pain and suffering these children go through is tremendous and you witness it over and over. As a nation we need to make sure our children receive the best possible research and treatment for pediatric cancer. It is our responsibility. Cancer is the number one disease that kills our children. We need to save our children for longer than 5 years. I am just one mother with one child. There are hundreds of foundations out there trying to bring awareness to childhood cancer and raise research money. We all need to unite as one strong group to fight for our children. 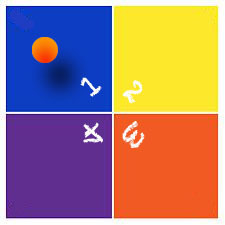 Numbers bring strength. What these kids go through to survive the 5 years is horrible and a lot less make it much further than 5 years. Many children do not make it to 5 years. Why would they think a 5 year survival is enough for a child? 5 Years IS NOT ENOUGH! This entry was posted in Cancer, Childhood Cancer, Pediatric Cancer, Rare Disease and tagged American Cancer Society, autoimmune, biopsy, chemo, Cj Colton, clear cell sarcoma, CT, Ipilimumab, Joe Baber, kidney, MRI, National Cancer Institute, radiation, survival statistics, T-cells. Bookmark the permalink. 19 Responses to Five year cure, …really? 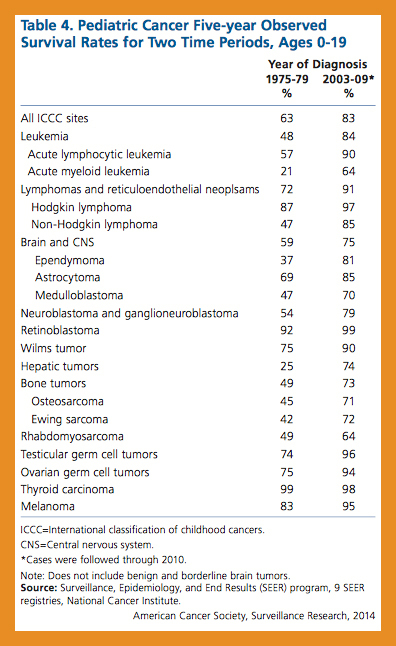 I don’t know about all their numbers on that chart, but I know those numbers on neuroblastoma must be wrong. Early stage maybe. Late stage kids didn’t stand a chance in the 70s. My son died in May. Late stage 4 that he fought for a little over 3 years. He did T cell therapy in TX Children’s. Didn’t help. Hope your child does better. I would have to agree. I lost my daughter to neuroblastoma in 1993. She did not have a chance. She only had a 20 percent chance since she was stage 4. 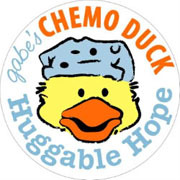 There are 16 major types of pediatric cancers and over 100 subtypes. 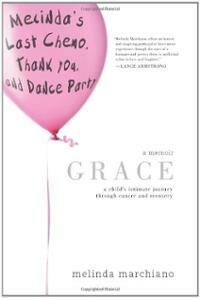 I am told that DIPG and glioblastoma, statistics are included in the Category Total, “Brain and CNS” line. 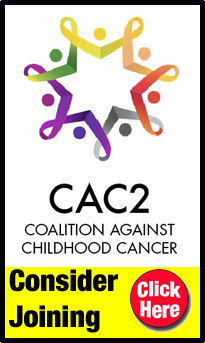 The complete ACS report can be found at http://www.cancer.org/research/cancerfactsstatistics/cancerfactsfigures2014/index . They don’t count Glioblastoma because they consider it incurable and don’t spend money funding research. There is too much money spent on Adult cancers and not enough on Children’s cancers. Also too much spent on Advertising instead of on the actual patients and finding cures.. Non-profit organizations are a joke. They spend millions on advertising and paying themselves. what about volunteering time across the board? That means doctors and major pharmaceutical companies too. They don’t get paid minimum wage. My daughter has been battling Neuroblastoma for 9 years now.. It’s the only life she has ever know and probably will ever know.. She has relapsed twice so they don’t ever say she is cured anymore. She has had over 80 rounds of chemo and still going. Our precious Grandson fought GBM for 359 days. Since he earned his wings on 4-15-14 his foundation – Brody Strong Foundation for Pediatric Brain Cancer Research is raising funds with ALL donations going directly for research. His family runs the foundation and none of us will EVER take ONE CENT for administrative, advertising, wages or ANY OTHER expense! We will NOT rest until a cure is found. Our courageous, smiling boy did NOT die in vain! I’ve long since said that when we can give our kids the equivalent of a sweet tart with no side effects, i’ll celebrate the cure. 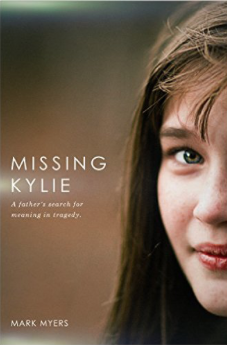 Cure does not mean; relapse, heart failure, brain metastasis, experimental treatments, having ‘the talk’, hospice, cutting your 18 year olds meat for her, saying goodbye. The five year statistic makes us all feel good, but it hides the truth. We have a long, long way to go. What about the side effects that it has on our children, my daughter had High Risk B Cell A.LL. now its her heart, dead bone in both legs, about lost her eye sight, weak all over has no engery and left behind a shut in. I have done every thing I know to do and she will lose both legs in time, still on pain meds…..any help out there ? My 8 year old son just finished three and a half years of chemo for ALL. I fell the same way you do and am a 2 year shavees and event organizer of my Communities St.Baldricks event. Please let me know of any ways I can spread awareness of help unite these organizations. Don’t let 5 year survival rates blur the real picture of what children with cancer will face in the years ahead after they are considered “cured” by most people. We need to look at the long term survival rate to get the clearest picture. Our son was still being treated for his relapsed Tcell ALL when he reached the 5 year survival mark. He has the usual litany of side effects. Stunted growth, lost fertility, radiation burn scarring (which will no doubt become skin cancer some day), cognitive damage, neuropathy…The list goes on and on. I don’t call that cured. We are immensely grateful for his sustained remission and survival but he will never be cured since cured, by definition, means a return to health. Amen! My son Sawyer was one of the children not so lucky to have survived 5 years. He battled a Stage IV Glioblastoma Multiforme, GBM, Brain Tumor/Brain Cancer for 21 months before dying at just 8 years old. He was diagnosed just 7 days before his 7th birthday. He endured all the horrific treatment options & torture involved with each one; port access, blood draws, radiation, hair loss, blistered mouth, burnt skin, IV chemo, oral chemo, nausea, vomiting, diarrhea, the works! It was horrific, and yet he smiled, he smiled when he wasn’t screaming bloody murder because his port was being accessed or he was deathly ill & vomiting his guts up, other than those times, he did, he smiled. The resilience these children demonstrate is mind boggling. You have never seen a hero or witnessed bravery until you see first hand, with your own eyes, a child fight cancer! They are amazing! They are innocent! They are fighters! This disease is so grossly underfunded by our government that it’s pathetic! The measly 4% that they so ‘graciously’ throw at pediatric cancer research to patronize us parents, is quite frankly an insult! My son & every other child are worth more than 4 stinking cents out of each dollar. Children are being diagnosed & are dying at an alarming rate to this number ONE killer of children. 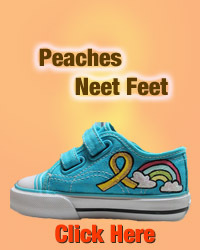 Childhood Cancer kills more children each year than all other childhood dieases combined! Seven (7) day each day from cancer & forty four (44) new cases are diagnosed each day! I personally know that the majority of brain tumors/brain cancers diagnosed today are DEATH SENTENCES! THERE ARE NO CURES, NO “BUY YOU TIME” MEDS, NO NOTHING, EXCEPT NO OPTIONS! That’s what you get with a GBM or DIPG diagnosis, death! Some as soon as 6 weeks after diagnosis! This is unacceptable & we, not only cancer parent, but we as a country, as good human beings, need to demand that this change! It’s an epidemic that is falling on deaf ears in Washington & we need to make our voices be heard, NOW, NOT NEXT WEEK, NOW, TODAY! 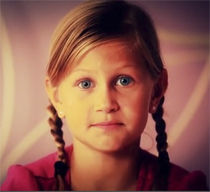 The children can not fight this disease alone, nor should they have to. So be their voice, do your part, write your senator, spread the word, demand the change for our children, they ARE THE FUTURE! WAKE THE HELL UP AMERICA! Each child that dies from cancer is one too many! We need more than 4% – let’s get real! Real serious about making change! How do WE STOP THIS? How do we band together to stop this atrocity? If i live another day…i want to make a difference for the kids. My son was diagnosed at 13 and two years and a bone marrow transplant later we still fight! As parents, how can we make a difference? How can we save our children? My heart aches for each and everyone of you who lost your babies, i live in fear of that everyday! Lets band together and demand more! Just lost my beautiful granddaughter on May 25, 2018. Three days before her 16th birthday. 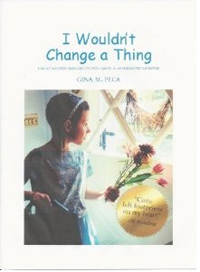 She was diagnosed with Ewing Sarcoma on May 8th, 2013. Months of chemo, radiation, transfusions, scans, stem cell transplant and surgery. Destroyed her little body. Just doesn’t seem fair. Too many children suffering. Stella, I can’t begin to tell you how sorry I am for the loss of your granddaughter. No grandmother should endure this. I assure you that I will use this loss and others to bring awareness to childhood cancer. If you would like to provide more information, I would be glad to do an article about your granddaughter’s fight for Four Square Clobbers Cancer.